Jesus Christ is to be preeminent in all of life (Colossians1:15-18) - Every aspect of our lives should be viewed from a biblical perspective. No subject can be understood fully and accurately when the Creator-Savior is ignored or denied. Every subject is taught from the perspective of a Christian worldview with Christ at the center. Worship and Praise are a distinctive focus of Summit. Parents are the ultimate educators (Deuteronomy 6:6-7, Ephesians 6:4) - and are responsible to God for the godly education of their children. They are under mandate from God and must not abdicate that responsibility. 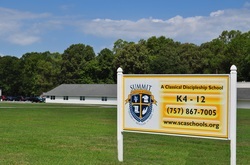 Summit Christian Academy is a tool parents may use to accomplish that mandate. Summit is committed to promoting and encouraging the family unit. Parents are highly involved throughout the school and feel ownership in it. Summit desires to play a positive role in strengthening the family. All truth is God’s truth (Psalm 24:1-2) - without division into sacred truth and secular truth, including not only the Bible, but also history, mathematics, science, language, music and the arts. God’s Word is Truth. The Bible is seen as our ultimate source for Truth. Teachers are not afraid to use secular sources to teach God’s truth in any subject. Truth is knowable and not relative (Psalm 119, Matthew22:37) - through God’s general revelation in creation and His specific revelation, the Bible. God is honored when we recognize in creation His attributes, laws, and ways. God is honored when we use our minds to their fullest capacities to seek truth, discern truth, investigate, and question. God invites our inquiries (Isaiah 1:18a). Students are encouraged to be inquisitive and to investigate. Students are equipped with the tools for life-long learning. Students are taught that there are absolutes in life. Right and wrong are not relative to the whims of society. Life has design and purpose (Romans 12:2, Matthew 28:18-20, Ephesians2:10) - Man is to live his life enjoying and glorifying God, becoming molded into the image of His Son and influencing others for the Kingdom. We are called to influence those around us, our own culture in which we live, and even the whole world. Students learn not only their own culture and language but also those of other people groups. Students are taught how to communicate effectively through the written and spoken word. Latin and a modern language are taught. Students are exposed to world missions. Children are born as sinners and therefore require training and firm discipline (Romans 1,3:23) - However, we are made right with God, not because of our own obedience or goodness, but because of what Jesus Christ did on the cross for us. Remembering that helps us to balance justice with mercy. As a discipleship school, we desire to see each student strengthen his or her personal relationship with Jesus and learn to live a righteous life by grace. Students are actively encouraged to grow in their faith. Compassion and mercy are not forgotten. We are called to serve (Ephesians 6:7) - Knowledge and education are not ends unto themselves but are to be used for God’s glory as a means to bless others. The older will be taught to serve the younger; the quick to serve the slow. Summit emphasizes humility and a servant’s heart. Summitprovides role models and opportunities for serving others. Students are taught that we are here for a purpose. Every child is a gift from the Lord and gifted by the Lord (Psalm 127:3, Romans 12:6, Ephesians2:10) - Every child is known and loved by Him, and each life serves a purpose. Summit is dedicated to helping children discover their own unique, God-given gifts and purposes and implementing them in life. Fine Arts are encouraged and supported. Summit is not an elitist school. 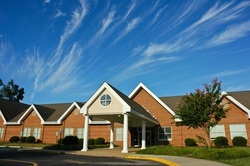 Summit provides educational therapy through NILD. Knowledge is valuable, yet Godly wisdom is the desired goal (Proverbs3:13,9:10; Psalm 111:10) - Wisdom is knowledge properly applied from a Godly perspective. Weekly chapels stress the attainment of wisdom. Students are taught how to think like Christ and discern critically. Summit inculcates Knowledge (Exodus 35:43), Understanding (Proverbs 2:6), and Wisdom (Daniel2:21) - Pedagogy must acknowledge, respect, and address the physical and cognitive development of a child. Summit educates within the framework of the Trivium, a traditional approach that applies the Biblical concepts of knowledge, understanding, and wisdom to the developmentally appropriate stages of a child: grammar (grades K4-6), dialectic (7-9), and rhetoric (10-12). God has called us to do everything as unto Him (I Corinthians10:31) - and serve Him with all our might. We are called to “study to show ourselves approved” (2 Timothy2:15). Students are encouraged on toward excellence. Hard work is valued and rewarded. God looks at the heart (I Samuel 16:7) - The measure of a man or woman is not the externals of appearance or of achievement; instead, it is godly character traits such as integrity, courage, perseverance, compassion, loyalty, responsibility, and righteousness. Students wear uniforms to allow them to focus without unnecessary concern for externals. Students study the lives of historic Christians as models of Christian virtues. God is in control (Isaiah 46:10, 61:1-2; Daniel4:25) - He is not capricious. God has a plan and is purposefully directing the course of history and the culture in which we live. Students study history systematically, realizing that there is design leading to Christ’s return. Students are encouraged to learn to walk by faith, having confidence in God’s control over circumstances even when they do not see it. As a school, we place our trust in Him not in ourselves.